Don't take the title of this post wrong. Nothing has happened to Genny. I just found some old photos of her and it got me sort of, well, sentimental. She is still at least a year away from leaving our nest. This is just a tribute to her as we wait the start of berry reports (first report in late June). 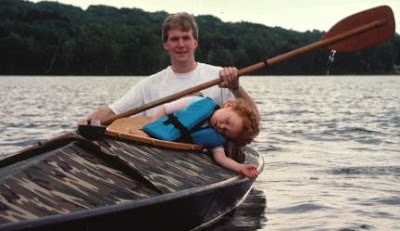 I found this old picture from 1993 of Genny and me in our first duckboat, which I built from a kit (Folbot) purchased from cash wedding gifts received in 1988. Gen was and still is well known for falling asleep at the drop of a hat. In fact, she just fell asleep in my office while waiting for a phone call (I was not talking at all, by the way). The picture above was taken on the Portage waterway. We were participating in a flotila of sorts that was welcoming a Lake Superior--Lake Baikal (Siberia) "awareness" group. Don't recall the taker of the photo, a friend of Jackie Huntoon. 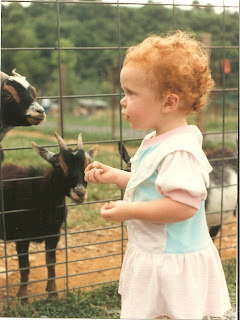 This was at a petting zoo in Dollywood, TN back in the summer of 1991. Little did we know that this would lead to an obsession with all things agricultural. More pictures of this obsession below (and throughout the blog). Duckhunting in Duck Bay, near Chassell, with Jimmy Wood in 1992. 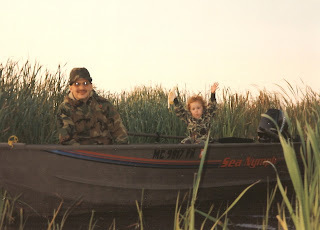 Ten years later she would shoot her first duck and goose on the youth duck hunt opener from this very same location and same boat, sans Jimmy. 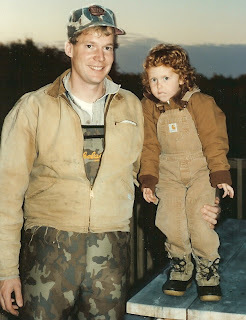 After a duck hunt, fall 1993. 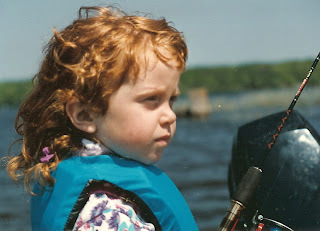 Look at the concentration while fishing in the summer of 1994 (4 yrs old). I tried to fuel this interest into an obsession, but lack of success diminished enthusiasm to a more practical level. 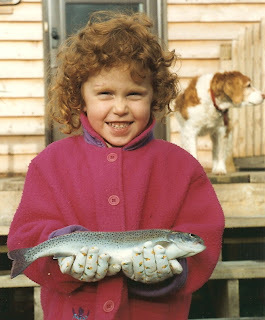 If we could have just caught fish like this more often (farm pond raised rainbow)... (dog in the background was my brittany, Trisha, who passed on later that year, 1994). 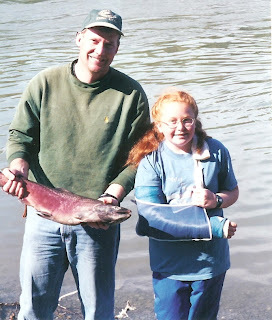 "We" landed this salmon on Crooked Cr., where it joins the Kasilof, near Soldotna, AK, in June 2001. Gen's elbow was broken on the last day of 5th grade, on the monkey bars at recess. This particular fish made two long runs, the first downstream, then it seemed to tire, but then regained strength, turned and ran past us up stream for another long run. There were some frantic moments as Genny tried to ignore LOUD and mostly contradictory instructions from her overexuberant father on how to land the fish. These were our first meat chickens. Gen quickly learned a personality difference between these chickens bred to grow fast and her favorites (bantams, see below). 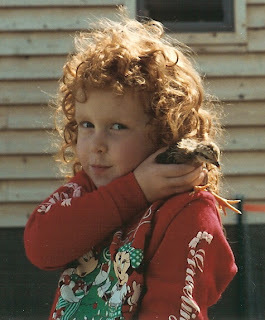 This was her first, of many, pet chickens. She called this one Brownie (as artistically creative and technically ingenious, she can be, Gen has always been a lame namer of pets). Brownie was a pretty little something or other that sported partridge-colored feathering. Brownie not only would go on shoulder rides but would also allow being dressed up (by Gen) in doll clothes. 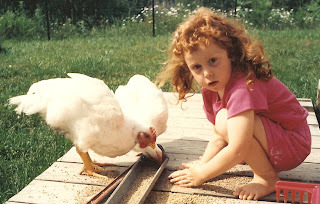 Gen spent much more time playing with chickens than she did playing with dolls. Poor Brownie was a victim later in the fall to a barred owl that got into the coop and wiped out our first flock, save for one, Rosie, who spent a lot of time in a bird cage in the house before her death from old age (about 8 yrs for chickens). Improvements in our animal caretaking and chicken-coop security measures has resulted in "most" of our chickens expiring from old age these days.